Wearable Artist Kay Chapman returns to Omaha with her hand painted shirts, jackets, and vests. Fabric is the canvas that Kay uses to create her own one of a kind, limited edition clothing. Kay was born and resides in Los Angeles, California. She received her B.A. in Design from California State University at Northridge. Her post-graduate work includes classes at UCLA and studies of Japanese dye techniques in Kyoto, Japan. Chapman has shown in galleries, and sold at boutiques throughout the U.S. Chapman works in silk, cotton, linen, and wool. She prefers the brilliance of the colors, drape, and luxurious sensual feel of these fabrics on the body. 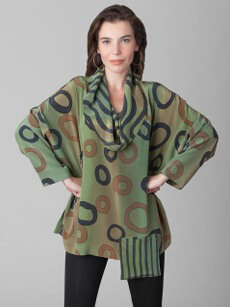 Her strong color sense and flattering styles result in timeless clothing lines and shapes. Her styles range from elegant day wear to special occasion evening wear always creating an expression of individual style. Appointments are available by calling Anne Fenner at 402.598.4898.